Last night's concert (15 May 2015) by Londinium brought old and new storytelling songs to St Sepulchre without Newgate in Holburn. From Josquin des Prez to Ola Gjeilo, with stops via Schumann and Brahms, the set of stories included mythical beasts (Unicorn, Phoenix and Hydra) and heroes (Alice in Wonderland, Ariadne, The King of Thule, Orpheus, Bunyan's Pilgrim and Robin Hood). Led by their enthusiastic musical director Andrew Griffiths, Londinium like to play around with the wide acoustics in St Sepulchre and began with quadraphonic sound for H. Garrett Phillips' (1941-1991) 'Odysseus and the Sirens'. Here the choir effortlessly invoked the sound of the sea as a ship carried Odysseus towards and passed the sirens calling his name. 1849 was the centenary of Johann Wolfgang von Goethe's birth and to mark the occasion Robert Schumann (1810 - 1856) wrote 'Der König von Thule' a setting of the 1774 poem by Goethe, which tells the story of an ancient King who, as he was about to die, drank one last time from the splendid golden cup given to him by his lover on her deathbed before hurling the cup into the sea. Although both stories involved the sea, the atmospheric sibilants of Phillips were expunged by the backwards-looking Schumann. Here Schumann started with a simple chorale, the parts gradually increasing in movement (showing off the beautiful bass sound with contrary motion) and becoming harmonically more complicated, with a picturesque ending that Bach would never have contemplated. Claudio Monteverdi's (1567-1643) 'Lamento d'Arianna' was taken from his 1607–08 opera 'L'Arianna' (libretto by Ottavio Rinuccini). Written for a royal wedding at the court of Duke Vincenzo Gonzaga in Mantua where Monteverdi was the maestro della musica, all the music has now all been lost apart from this one recitative. 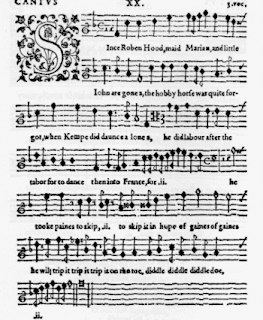 Monteverdi himself published two versions - this five-voice madrigal dates from 1614, and a solo version published in 1623. Londinium split into smaller groups for the first three sections. But while this version was pretty and made the most of dissonance, it did not have the emotional impact a solo opera singer could have brought to the role. 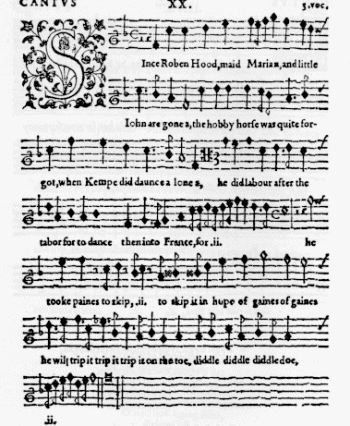 Nevertheless the contrast with Thomas Weelkes (1576 -1623) 'Since Robin Hood' (written the same year), both musically and in subject matter, was striking. Weelkes 1608 madrigal 'Since Robin Hood' was a riot of a romp. Written in the years prior to his dismissal from Chichester Cathedral (for being drunk) where he was organist and choirmaster this, from his last set of madrigals, shows no decline. While his church music was sombre and sensitive the madrigal showed his lighter side without compromising on style. From the same time period 'Dulces Exuviae' by Josquin des Prez (1450/1455-1521) kept to the classical story theme with the story of Dido and Aeneas from Book IV of Virgil's Aeneid. In 'Dulces Exuviae' des Prez made the most of long smooth lines and his writing allowed Londinium to make the most of their blend of voices. To go with the Schumann Londinium also performed 'La cigale et la fourmi' written by Charles Gounod (1818- 1893) in 1862. This setting of Aesop's Fable 'The ant and the grasshopper' dates back to ancient Greece, somewhere round about 620 to 560 BC. Johannes Brahms' (1833-1897) 'Sechs Lieder und Romanzen, Op. 93a' was written in 1884. The choir performed the humorous 'The hunchbacked fiddler', then 'The girl' and, in keeping with the mythical animals, 'The Falcon' - the last two were settings of poems by his contemporary Siegfried Kapper. Bohuslav Martinů (1890-1959) was thrown out of the Prague Conservatory but finding his own way with composition he was encouraged by fellow Czech, Josef Suk. 'Romance of the Dandelions' was written only a couple of years before his death while he was composer-in-residence at the American Academy in Rome. In a similar way to sharing out the madrigals the solo lines of the Martinů were shared out between the sopranos. Interspersed between these were more modern offerings. Ola Gjeilo (1978-) is a young Norwegian composer who is making a name for himself. He studied composition at the Norwegian Academy of Music, Juilliard School and at the Royal College of Music, but now lives back in the US. In 2012 his album 'Northern Lights' won Best Classical Vocal Album of the Year by iTunes. 'Unicornis Captivatur' was written in 2001 based on mediaeval chants from c1400 Engelberg Codex. Joyful and atmospheric, Gjeilo has managed to seamlessly bring together smooth modern choral styles with the rhythms and process of more ancient music and Londinium's blend and flexibility brought it to life. Ralph Vaughan Williams' (1872- 1958) 'Valiant-for-truth' sets a speech from his opera 'Pilgrims Progress' for chorus (1940). Based on the allegory by John Bunyan this section relates the end of the story as the trumpets sound for the Pilgrim's death. David Del Tredici (1937-) 'Acrostic Song' is another song from an opera – his 1976 opera 'Still Alice'. Tredici has been fascinated by Alice for many years having written at least nine works based on 'Alice in Wonderland'. He was a friend of Aaron Copland, and is hailed as one of the main proponents of the American Neo-Romantic movement, winning a Pulitzer Prize for 'Child Alice' in 1980. 'Acrostic Song' is based on the last poem from 'through the looking glass' and was saccharine in the extreme. Even the more imaginative ending repeats of 'but a dream' failed to lift this to the level of the Gjeilo. An interesting and balanced programme (something for everyone?) Londinium shone in the Gjeilo and Phillips, and they performed the Vaughan Williams as though it had been written for them. 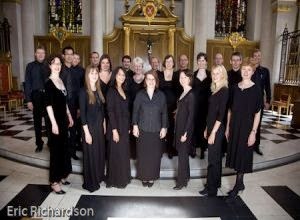 Londinium's next concert is 'Songs of Farewell' 3rd July at St Sepulchre-without-Newgate.